A story of resistance, complicity, and an unlikely, transformative friendship, set in Paris, from internationally bestselling novelist Sebastian Faulks. American historian Hannah intends to immerse herself in World War II research in Paris, wary of paying much attention to the city where a youthful misadventure once left her dejected. But a chance encounter with Tariq, a Moroccan teenager whose visions of the City of Lights as a world of opportunity and rebirth starkly contrast with her own, disrupts her plan. Hannah agrees to take Tariq in as a lodger, forming an unexpected connection with the young man. Yet as Tariq begins to assimilate into the country he risked his life to enter, he realizes that its dark past and current ills are far more complicated than he'd anticipated. And Hannah, diving deeper into her work on women's lives in Nazi-occupied Paris, uncovers a shocking piece of history that threatens to dismantle her core beliefs. Soon they each must question which sacrifices are worth their happiness and what, if anything, the tumultuous past century can teach them about the future. 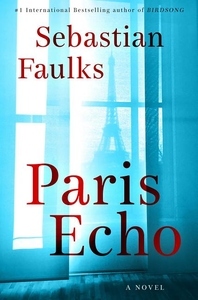 From the sweltering streets of Tangier to deep beneath Paris via the Metro, from the affecting recorded accounts of women in German-occupied France and into the future through our hopes for these characters, Paris Echo offers a tough and poignant story of injustices and dreams.